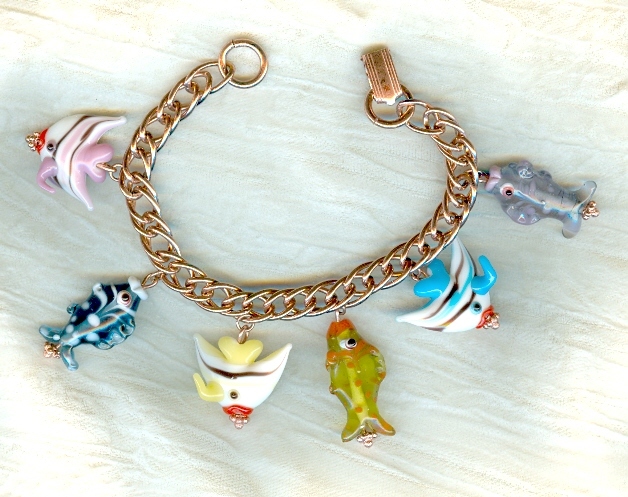 Every colour in the whole tropical reef glows and glimmers in these one of a kind lampwork glass fish charms. Six of them dangle from a sturdy 7-1/2 inch long copper chain bracelet. It closes with a copper foldover clasp. When nothing but the very best will do, come to SPARKLE PLENTY. This whimsical jewelry set is all about cats and their dinner of choice: fish. Each earring sports a trio of Cheyenne stitch fish: one each in shades of coral, turquoise, and lavender.